Looking at the booklet for the show ‘How We Are: Photographing Britain’ before making my way into the gallery I got a shock. The curators appeared to have omitted the very man who started the whole thing, W H F Talbot. I checked again – it couldn’t be true, and thankfully it wasn’t. They had simply placed him wrongly in alphabetical order under the letter F. So when I realised that H P Robinson was missing, I immediately looked for him under ‘Peach Robinson’, but he wasn’t there either. 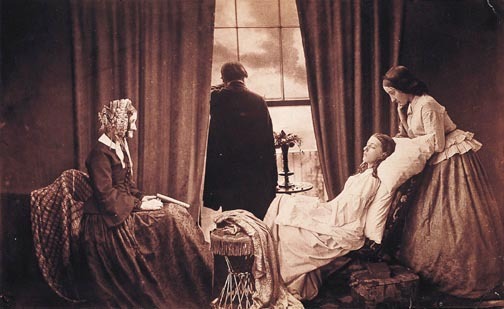 Although Rejlander’s ‘Two Ways of Life’ showed a path for photography, it was one taken most enthusiastically by his friend Henry Peach Robinson (1830-1901), who, over the years, starting with ‘Fading Away’ (a ‘touching’ deathbed scene which is perhaps hard for us to appreciate, but was only too common an experience in the era before modern medicine) produced a number of impressive works using similar combination printing techniques (such as ‘When The Days Work is Done’, as well as many fine portraits and landscapes. ‘Fading Away’ is one of 12 images by H P Robinson available on the Free Information Society web site. Robinson had trained and exhibited as a painter and was a great fan of Turner and of the Pre-Raphaelites, and he composed his works in much the same fashion, and dealt with some of the same subjects, including for example, a picture of “The Lady of Shallot“. His use of combination printing continued to cause controversy in photographic circles, Robinson arguing that the aim of photography was to make beautiful pictures, and that the techniques used were irrelevant. He explained his appraoch in the influential book, “Pictorial Effect in Photography“, published in 1867, and was famously involved in arguments with another great photographer, Peter Henry Emerson, who favoured a more simply photographic approach to produce pictorial images. Pictorialism to which both men contributed, remained a powerful influence in art photography for the next 40 or so years, particularly through groups such as the ‘Linked Ring’ (a strangely masonic guild established by Robinson and others when he left the Photographic Society in 1891) and various other seccesionist groups of art photographers based in other countries. Although pictorialism was eclipsed in art photography by the rise of modernism in the early twentieth century, much of the debate between Robinson and Emerson had strong resonances in the 1970s and since, when increasingly fine artists began to take up photography and reject much of the purist orthodoxy. This entry was posted on Sunday, May 27th, 2007 at 05:18 pm and is filed under Photo History, Photo Issues, Reviews etc. You can follow any responses to this entry through the RSS 2.0 feed. You can leave a response, or trackback from your own site.